Living in Sunny South Africa! : My last layout for Sketches in Thyme!!!! I must say this has to be one of my faves I have ever created for my son Caide, it has a funky trendy hip vibe to it, which I feel is perfect for his "finally thirteen" page. Do you like it? Here is the sketch we got to play with, as per usual I adapted it to a one page layout!! We would REALLY love for you to play along with us!!! 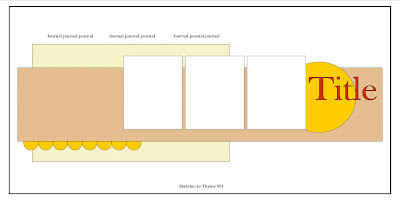 Once you have created your layout link it at the SKETCHES IN THYME blog!!! especially like the little felt embellishments. Your boys are all so handsome!!! Awesome page Rene!! Love the mix of the Black with the Green and Blue! Great use of embellishments and I love the way you used the sketch! !